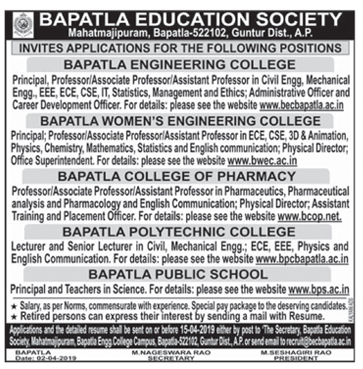 Bapatla Women's Engineering College, Guntur has advertised in the EENADU newspaper for the recruitment of Teaching Faculty- Principal / Professor / Associate Professor / Assistant Professor Plus Non-Faculty jobs vacancies. Interested and eligible job aspirants are requested to apply on or before 15th April 2019 . Check out further more details below. College Profile: The Bapatla Women's Engineering College, one of the seven educational institutions sponsored by the Bapatla Education Scociety, was established in 2009 with a vision to impart quality technical education and is affiliated to Acharya Nagarjuna University. The College is located in Bapatla, a town with a historic and hoary past, about 75 Km. south of Vijayawada on Chennai-Vijayawada rail route.